Toddlers will be fascinated by this color-matching activity board! 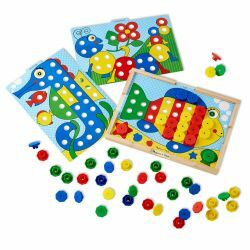 Ten reversible picture cards guide children as they place the snap caps in the holes. On one side the picture card is in color for matching, while the reverse is in black & white for more open ended designing! Ages 2+.